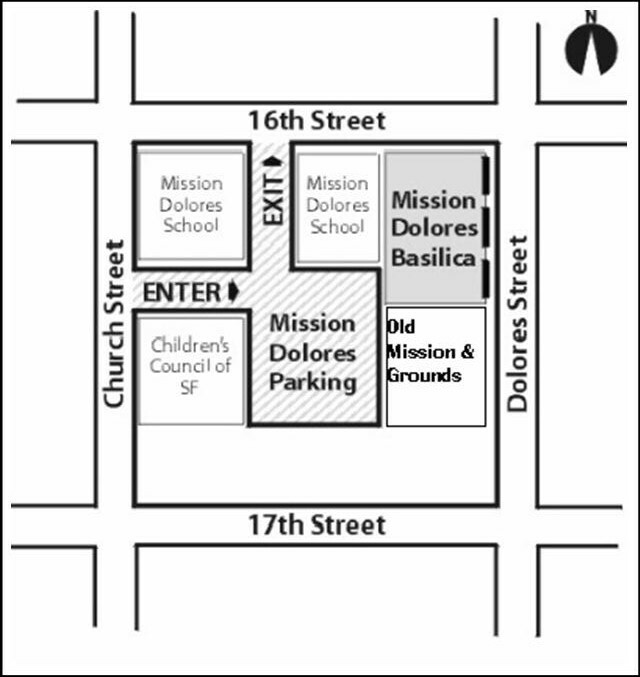 The Mission Dolores Basilica is located at the intersection of 16th and Dolores Street. The parish office is at 3321-16th Street. Click here for a downloadable pdf map. Mission Dolores Basilica is easily accessible by public transit. The 22 Fillmore electric bus stops at the front door. Additionally the J Church streetcar stops one block to the west at Church Street. The 16th and Mission BART station is 3 blocks to the east at Mission Street. For people who are driving, there is complimentary parking in the Mission Dolores parking lot. Parking is ONLY available on the weekends. Enter on the east side of Church Street between 16th and 17th.